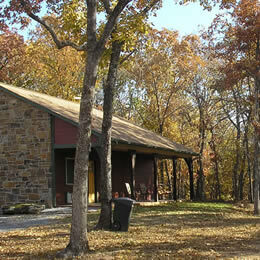 “Snappy Turtle” cabin was built in 2009 and designed to provide larger rooms, more amenities and extra privacy. It is perfect for couples celebrating a special occasion, a wedding anniversary, birthday, even a honeymoon, or couples who enjoy having more space and privacy. Both rooms include king size beds along with a whirlpool tub. Snappy Turtle 3A features a king-size bed and private bathroom that features a two- person whirlpool tub/shower combination with separate vanity/sink area. It is over-size with approximately 420 square feet and a closet. The room includes reclining/rocking theater chairs with ottoman and bistro dining table. 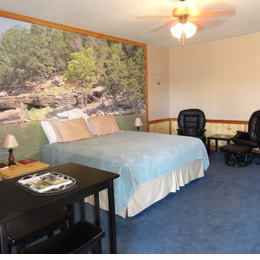 The contemporary room design is complemented by a 9’ x 12’ photomural of Lake Tenkiller. This room opens to 336 square feet of private covered deck that includes patio furniture, porch swing and access to a Weber grill. Rate starts at $189 per night (single or double occupancy). 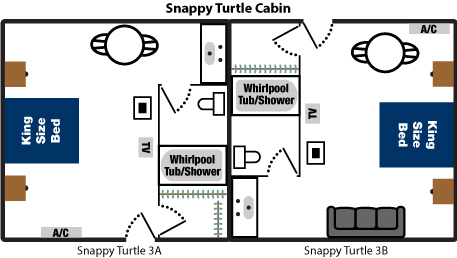 Snappy Turtle 3B features a king-size bed and private bathroom that features a two- person whirlpool tub/shower combination with separate vanity/sink area. It is over-size with approximately 420 square feet and a spacious closet. The room includes reclining/rocking theater chairs with ottoman and bistro dining table. 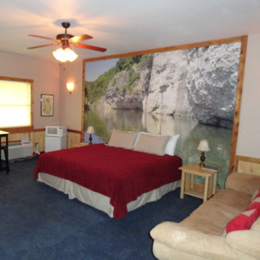 The contemporary room design is complemented by a 9’ x 12’ photomural of Lake Tenkiller. This room opens to 336 square feet of private covered deck that includes patio furniture, porch swing and access to a Weber grill.